Who like to eat the artichoke. Cuz that stuff is really weird. Boil, dry, and scoop the gut. No need for any special skill. Make them shiny, you’re the boss. Fingers are our only gear. 1 T coarse salt, plus 1 tsp. To clean artichokes, start by cutting the stem off the bottom. Remove all small or dry leaves at the base of the artichoke that may be too tough to eat. To remove the sharp thorns, snip off the tips of the leaves with a pair of scissors. 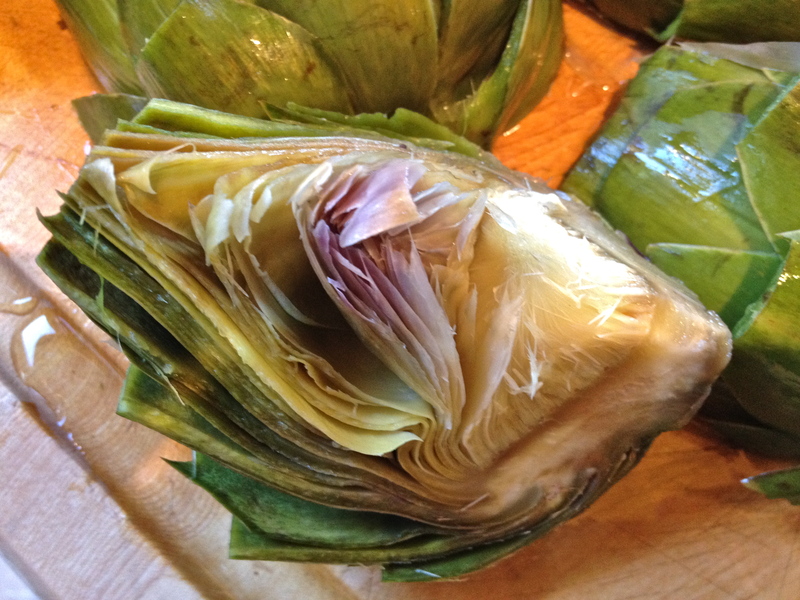 Use a serrated knife to cut and flatten out the top of the artichoke. Wash and dry artichokes. To be certain that the water does not remain trapped in the leaves it is best to dry the artichoke upside down on a towel. 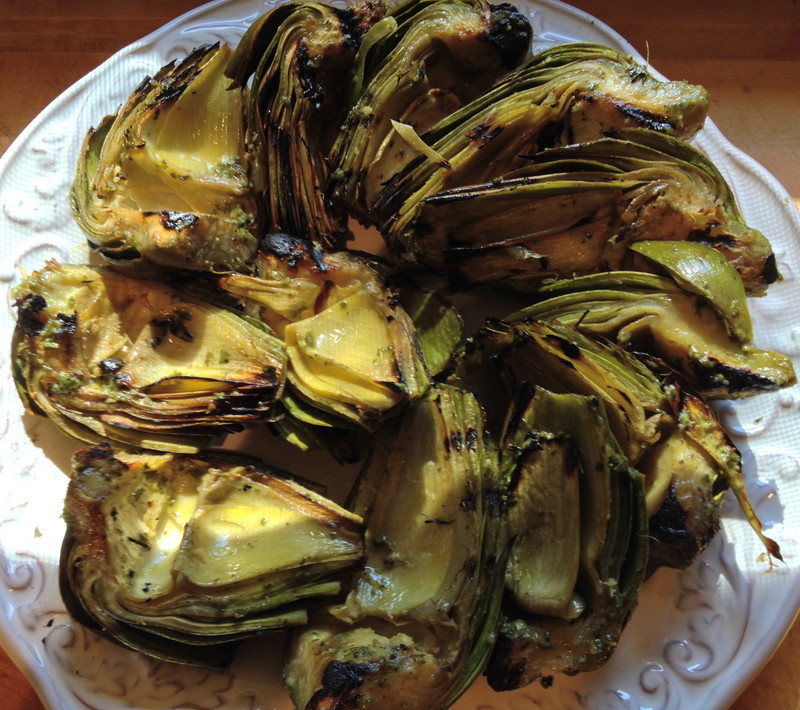 When dry, cut the artichoke into fourths. 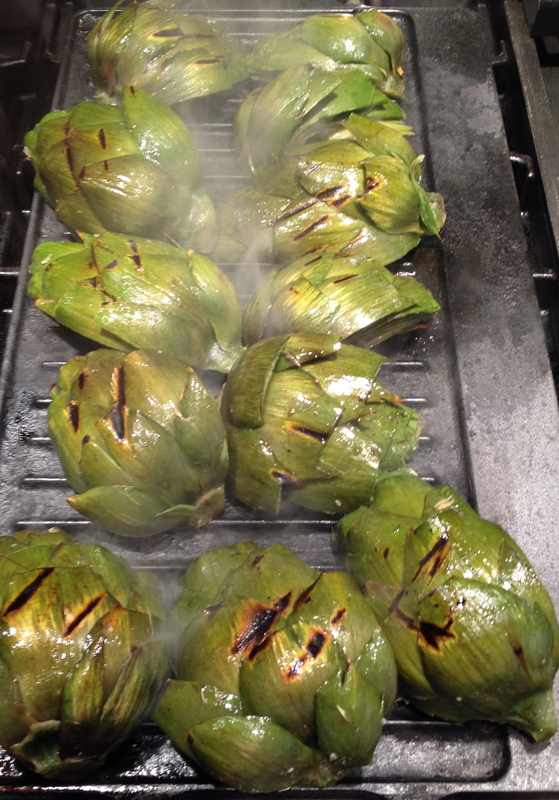 Place the artichokes in a large pot of boiling water. Add 1 T of salt. Turn to medium low and cook for 12 minutes, or until leaves are tender. Take out and let drain. When cool, scoop out the purple leaves and beard below them. Brush both sides with olive oil and sprinkle with salt. Place them on the grill on medium heat for 5 minutes on each side. When done, brush them liberally with pesto sauce, drizzle a little extra virgin olive oil and add another pinch of salt. Serve hot off the grill, room temperature, or even cold. Serves 6-8.